Muskmelon (Lat. Cucumis melo) is a herbaceous plant, which belongs to the family of Cucurbitaceae and is therefore considered a vegetable. It is also called melon. However, many consider muskmelon a fruit. It originates from Asia and Africa. It is very likely that even thousands of years ago it was transferred to other parts of the world. The ancient Egyptians already considered melon as a delicacy. Old Romans, and of course the Greeks, were liked muskmelons a lot. The first area in which the melon began to grow intensively was France, three hundred years ago. The melon has an oval shape. Usually 15-22cm in length and weighs around 1-2 kg. The hard crust can be smooth, wrinkled or mushy. The inner, edible part is usually orange and light green, and the hollow is filled with seeds. Dark green leaves are melted on the edges and are alternately arranged on stems. Even though it is not considered a fruit, muskmelon is used to make a compote, jam, marmalade. In addition, it is used in the preparation of fruit salads, in sophisticated cuisines, salsa is made that goes excellent with duck meat. This sauce is served with fish and chicken from the grill. In India, hot chicken curry is served with muskmelon. Melon balls are often added to drinks. 53 calories, 0.3 g of fat, 13 g of carbohydrates, 1.4 g of fiber, 30% of the daily amount of vitamin A, 78% of the daily amount of vitamin C.
In some Californian varieties, the 100-percent daily requirement of vitamins A and C has been measured. This delicious fruit is rich in antioxidants, colin, zeaxanthin and beta carotene, which provides protection against a range of diseases - from plain cold to cancer. Considering that 90-95% of its composition is water, it is ideal for hydration during hot summer days. Seeds, which are also edible, contain proteins, fibers and omega-3 fatty acids in the form of alpha-linoleic acid. The risks of developing asthma is lower in people who consume higher amounts of certain nutrients. One of them is beta carotene, found in yellow and orange fruits such as melon, pumpkin, carrots and green leafy vegetables like kale. Vitamin C is also an important nutrient that protects against asthma, it helps against the loss of oxygen, and reduces the risk of allergic reactions, and the melon contains it in large quantities. Muskmelon contains nutrients important for eye health - beta carotene (from which vitamin A is released), vitamin C, lutein and zeaxanthin. Zeaxanthin is an important carotenoid absorbed in the retina of the eye where it acts as an antioxidant and as an UV protection. Several studies have shown that carotenoids slow down the destructive process in the retina and the retinal pigment leading to macular degeneration (a disease of the central part of the retina that usually occurs in elderly people). Given that numerous studies have indicated that a serious lack of vitamins A and C can lead to glaucoma and macular degeneration, and even to blindness, melon is an excellent choice for preventing or slowing down the development of these disorders. Muskmelon belongs to easily digestive foods and it is recommended to eat it on an empty stomach before another meal. It is also a good choice for those with sensitive stomach because it contains enzymes and does not consume the energy of the digestive system. Due to the abundance of fibers and water, it prevents constipation and helps regulate digestion, digestive tract health, and ejection of toxins from the intestine. Colin is an important nutrient in the melon that helps give better sleep, learning and memory. It is also important for the maintenance of elasticity of cell membranes, transmission of nerve impulses, fat utilization and reduction of chronic inflammation. Regular consumption of melon helps to reduce oxidative stress and thus reduces inflammatory processes that can lead to the development of arthritis. Inflammation in the body is also associated with the formation of a metabolic syndrome that indicates a group of metabolic disorders. These disorders are expressed as insulin resistance, accumulation of fat tissue in the area of ​​the abdomen (abdominal or central obesity), high cholesterol levels and elevated blood pressure. Studies have shown that women who consumed 350 grams of fruit per day had a significantly lower risk of developing this syndrome. The study included muskmelon, apples, grapes, watermelon and bananas. Regular consumption of muskmelon is excellent for the beauty of the skin and hair. This is due to the influence of vitamin A that is necessary for the production of a sebum that moisturizes skin and hair and is essential for their growth. Vitamin A is essential for pure tan, and can also help protect against UV rays that cause faster skin aging. In addition to vitamin A, vitamin C is important for the construction and maintenance of collagen that gives the skin and hair a structure. That's why the melon is an excellent aid against wrinkles and premature aging. Except for nutrition, you can also use it directly on the skin and hair as a mask or regenerator. Muskmelon is a rich source of antioxidants that play a protective role in preserving healthy body cells from damage and inflammation that can lead to cancer. 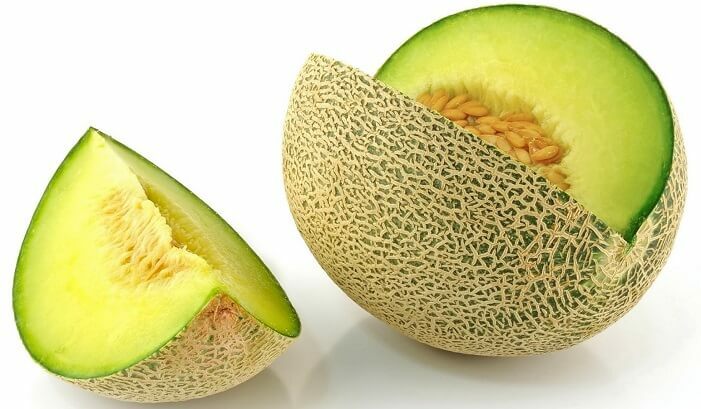 Thus, many studies have come to the conclusion that melons can be useful in the prevention of cancer of the stomach, prostate, breast, endometrium, lungs and pancreatic cancer. The melon compounds of corn cubes have repeatedly shown anti-cancer activity during the study. Their activity varied from reducing the spread of cancer and self-destruction of the cells to the complete stopping of the cell cycle in cancer cells. Seeds of melon are particularly recommended for kidney disease, especially with renal calculi or kidney stones. Seedlings have a cooling effect and are ideal for consumption during the summer. In India, minced seeds of melon are added to lassi (yoghurt beverage) and thandai (cold milk with spices), and whole seeds in candies and sweets. Fruits, seeds and oil from seeds are an ancient remedy for the treatment of various disorders such as cough, temperature, parasites, gastric, digestive, kidney and urinary disorders. Tea from melon is used for coughing. Against Cramps - Take two teaspoons of melon seeds and two teaspoons of cucumber seeds. Mix them together with 600 milliliters of boiling water, leave it covered for two hours, then strain. Drink 100 milliliters before breakfast, and 200 milliliters before lunch and dinner. The treatment lasts for ten days. Against frequent urination - Mix two teaspoons of finely chopped seeds of melon and cucumber and a spoon of chopped cherries. Pour everything with 700 milliliters of boiling water and let it stand for two hours covered. Strain and drink 250 milliliters three times a day before meals. The therapy lasts for five days. For the refreshment and strengthening of the organism - The melon juice is strained manually or in a juicer and it should be mixed with yogurt, honey and lemon juice. The mixture should be drunk 2-3 times a day in the amount of one glass. For dry skin care - squeeze the juice of fresh melon, add the same amount of milk and rose water. The acquired lotion thus apply on the face, in the evening and in the morning, and possibly more often. Once you put the lotion leave it to stand for 20 minutes, then wash with lukewarm water. If you use beta blockers or you have less functional kidneys, use muskmelon in moderate amounts.